Semur-en-Auxois is on the Armancon River in the Cote-d'Or department of Burgundy, 20 kilometres south of Montbard and 30 kilometres north of Saulieu. 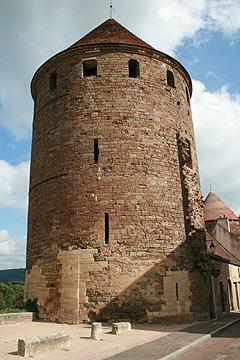 A legend tells that Hercules built Semur after returning from Spain. I'm afraid I can't confirm whether this is true! However the town did play an important role in the Burgundian strategy during the Hundred Years War at a time that the powerful Dukes of Burgundy were opposed to the French throne. The town is one of the most popular attractions of the region - not surprising because Semur-en-Auxois is a pretty town, built on a pink granite rocky outcrop above a river and watched over by the stout round towers of the castle. One important highlight of a visit is undoubtedly the first view as you approach the town and see the towers poised high above the river: this view across the bridge towards the towers is exceptional. Semur-en-Auxois has a wealth of cobbled streets lined with ancient houses, shops and cafes and unusual features to explore and enjoy. The architecture is a mixture of half-timbered properties and more 'recent' houses with characterful faded shutters and wrought iron balconies. 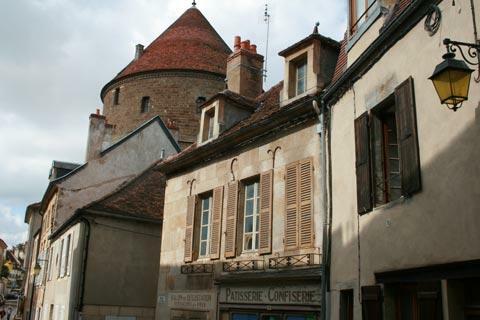 Passing through the clock-gate at the top of the town you find a small open square with several restaurants and shops to explore, and the historic centre of Semur-en-Auxois is all easy to reach from here.. 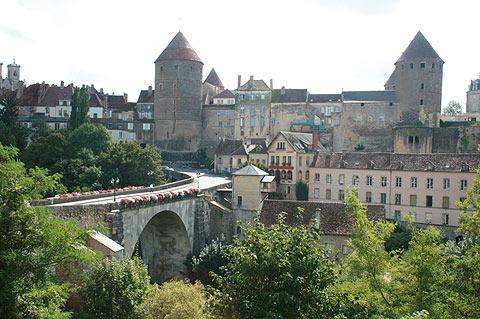 Particular sights of interest in the centre of Semur-en-Auxois include the four towers, all that remains of Semur's castle, and the gateways that once controlled access into the historic centre. The castle was demolished in the 17th century but luckily the four large towers are still standing: don't miss the traditional wooden 'chessboard' roof of the Renaissance Tower. 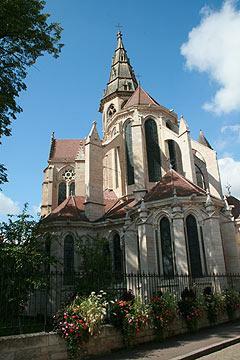 The Church of Notre-Dame also dominates the centre of the town. 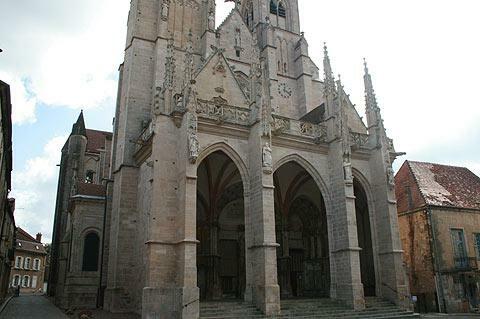 This 13th century church is one of the most impressive examples of gothic architecture in Burgundy and stands on the main square in the town, the Place Notre-Dame. There is a small park behind the church, perhaps the best place to see it from - in particular the chevet of the church, with its two levels. The church has been redesigned and renovated over the centuries but still retains a significant part of its original character. 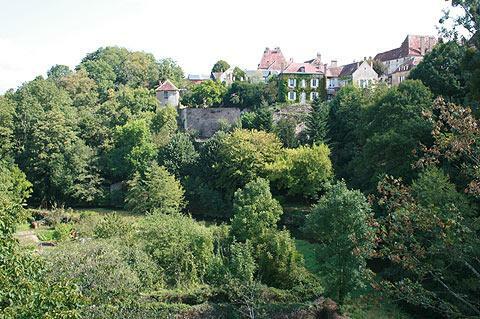 Another pleasurable pastime is to walk around the ramparts of Semur-en-Auxois, which has lovely views along the valley of the Armancon river..
After exploring the town centre you can also walk down to the Armancon river and see the lovely stone bridge, the Pont Joly, as well as the views from the bridge - both up to the town, and either way along the picturesque river valley itself. You can follow the river a little way to a 19th century lavoir (washhouse), although access to the river itself is unfortunately quite limited for part of the way, being behind houses. 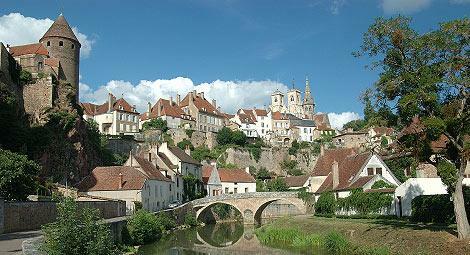 If you visit during the summer you can take the little tourist 'train' guided-tour of Semur-en-Auxois. There is also a small museum celebrating the long history of the town, housed in the 17th century Convent of the Jacobins. 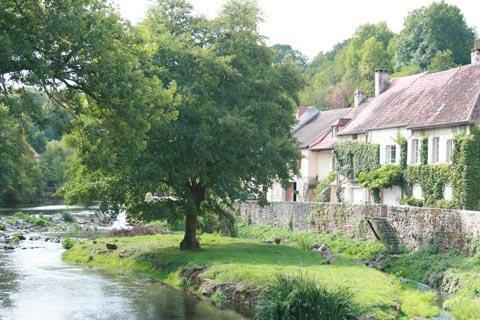 Two of our favourite places in Burgundy are within easy reach of Semur-en-Auxois. 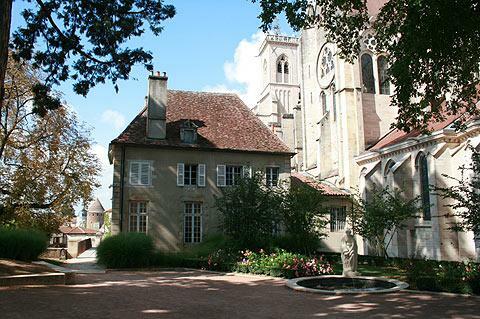 The first is the very peaceful Fontenay Abbey, in a lovely wooded valley north of the town, and the second is the charming medieval village at Flavigny a few kilometres to the east. Slightly further but well worth the trip is the historical town of Noyers-sur-Serein, about 40 kilometres north-west of of Semur-en-Auxois.